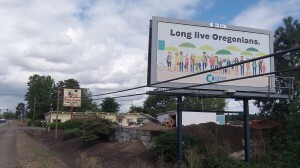 The idiotic billboards were an ill omen for Cover Oregon’s attempt to set up an insurance marketplace. It’s not super surprising that Oregon and the federal government have had trouble setting up their online “exchanges” for people to apply for and purchase medical insurance. They’ve made it too complicated. What’s surprising is how much Oregon has spent on this venture without getting results. Overall, according to a report in the Portland Oregonian, the work to get started in Oregon has cost $160 million, including the $90 million the state has paid the Oracle technology company. At last report, the online marketplace was not working and there was no reliable clue when it would. The state had enrolled about 40 or 50 people in some medical plan by doing the paperwork by hand. The Oregonian article said setting up the online marketplace or “exchange” was no simple task because the site had to interact securely with state and federal agencies, tribes and a dozen insurance carriers. But why? People are required to buy car insurance, and the state does spot checks to make sure they do. What’s so complicated about buying insurance, especially since the Accordable Care Act says all policies must meet the same standards? The State & Feds are allowed to extend deadlines. Will they “extend” that courtesy to it’s citizens. One would think they would reduce the number of TV commercials (saving money) extolling people to sign up, until they have the mechanism in place so they can ACTUALLY sign up.